For more than ten years, the Tripawds community has compiled numerous resources to help those faced with amputation for their beloved cats and dogs. 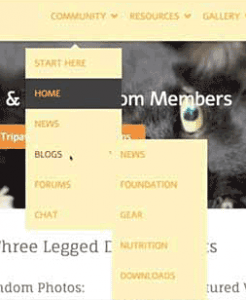 What started with Jerry’s Blog has grown into a network hosting more than 1,000 three legged dog and cat blogs, discussion forums, live chat, videos, photo galleries, podcasts and e-books, product reviews, assistance programs and more! With so much helpful information, it is sometimes overwhelming for new members to navigate the many helpful resources. That’s why we created the Tripawds Start Page, with details and helpful links for getting the most help and support from the Tripawds network. Still, when some new members find us in a state of panic or frustration, information overload can easily occur. We get that. If that’s you, take just seven minutes to watch this overview video for quick tips to easily navigate Tripawds and find the best help and support from others. Find your way around the Tripawds network. Search for answers in the discussion forums. Start a new forum topic and reply to others. Chat live with Tripawds members. Just seven minutes can save you time spent trying to figure out where to turn for the best help! Still confused? Call the toll-free Tripawds Helpline anytime. Looking for fast answers? Use the “START5” coupon code in the video to immediately download the Tripawds Library for lots of helpful tips and solutions to common canine amputation recovery and care concerns. Tripawd Tuesday: Sadie the Doberman is Beating Cancer! Best wishes for Captain! Find all the best harness recommendations and reviews in the Tripawds Gear Shop. The Web Master Plus is the best all purpose support harness we recommend for most Tripawds.